Solidarity initiative to collaborate in Mexican communities with limited resources, developing activities to promote “learning through play”, giving special attention to the groups most at risk of exclusion. The main goal is to provide tools, materials and work equipment so that activities can continue and can be organized independently. It’s a non-profit and self-financed project. 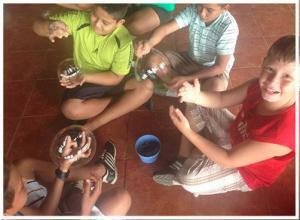 Participants perform experiments with soap bubbles, in which they learn tangibly science of this art. All necessary for the activity it’s given for free by bubble artist. Ideal for classroom since it’s preferred that the participants are seated. It’s recommended no more than 30 people per shift as maximum. Bubble shows out-door. 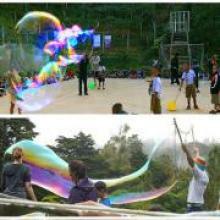 This activity is optimal for working with large groups, because while some make giant soap bubbles others admire its beauty. All necessary material and toys are provided for free. It’s GREAT for outdoor spaces. 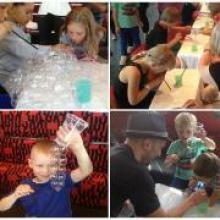 This activity fascinates everyone, because gives the chance to get INTO a GIANT bubble. This experience is for small or reduced groups and can only be performed indoors. All the necessary equipment is provided for free. Learning through play encourages the development of an integrated and harmonious manner. While people play can learn good stuff about oneself and the world around, promoting intellectual and emotional development, especially in younger children. Only with basic ingredients such as “water” and “soap” the participant will learn to transform them into a fun and totally playful activity. An experience that approaches the natural instinct of play to combine with entertainment and a better understanding of the world around it developping social skills useful for daily living. 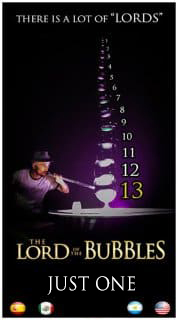 The ultimate goal of this project is to provide the necessary resources and all equipment needs to organize and carry out these activities independently (even bubble shows) and, of course, make happy others with the amazing world of the soap bubbles full of mystery and pretty good lessons to learn. If you know local mexican communities that could be interested in our workshops or activities, please contact us.